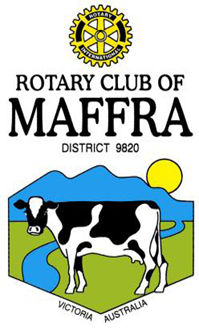 The Rotary Club of Maffra, after consultation with the community is pleased to announce they will be running the former Maffra Farmer's Market. Along with a change of name to the Rotary Club of Maffra Community Market there will be a new location. The new location will be off McMahon Drive on the Island Park which is directly behind the car park at Woolworths. Operating on the first Sunday of each month, except January, it will run from 7.00am for market stall holders to set up and will open to the public at 8.00am and close at 12.30pm. Of course there are forms to fill in! There are two forms on the front page, which can be downloaded, listing what is prohibited in our market (our underwriters requirements) along with an application form for public liability insurance for $7 per month, per stall. The other form is an application to have a market stall. Both forms will be available each market day, but to ease congestion please complete before hand. Please email rotaryclubmaffra@gmail.com for further details or for a market stall holder application form or application for public liability insurance to be emailed or posted out to you. You can also call 0409 030 918 or 0458 247 862 for more information.